A new effective life Ruling applying from 1 July 2018 has been issued – TR 2018/4. If you are not a Small Business taxpayer, and the asset is not eligible to be written off in the year of installation, then you will generally depreciate the asset under the Uniform Capital Allowance (UCA) regime over the term of its effective life. In determining the effective life of an asset, you have the choice to either determine it yourself, or you may use the effective life determined by the ATO (contained in this annual Ruling). Remember of course that Small Business Entities (businesses with an annual aggregated turnover of less than $10 million) still have access to the outright deduction for assets using the $20,000 Instant Asset Write Off. It must be separately identifiable in the payroll system as a separate allowance – not just folded into the employee’s salary. The ATO is set to focus on the claiming of work from home expenses, this tax lodgement season. “There is a rising trend of employees working from home, and while extra costs related to working from home are usually deductible, we are seeing some taxpayers either over-claiming or claiming private costs,” Ms. Anderson said. There is mounting evidence that many taxpayers don’t know what they can and cannot claim. In particular, we are seeing some taxpayers claiming expenses they never paid for, expenses their employer reimbursed, private expenses and expenses with no supporting records. One of the biggest issues we are seeing is people claiming the entire amount of expenses like their internet or mobile phone, not just the extra bit related to work. In reality, the rest of us are subsidising their private phone calls and internet usage, which is not okay,” said Ms Anderson. “If working from home means sitting in front of the TV or at the kitchen bench doing some emails, it’s unlikely that you are incurring any additional expenses. 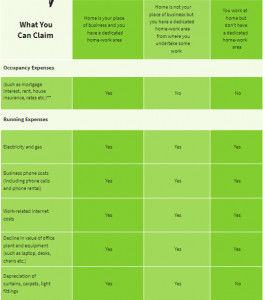 However, if you have a separate work area, then you can claim the work-related portion of running expenses for that space. “Employees cannot generally claim occupancy-related expenses like rent, mortgage repayments, property insurance, land taxes and rates”. To substantiate your home-office claim, you are required to keep a diary covering a representative four-week period as establishing a pattern of use for the entire year. You can then use this pattern of home office use to calculate the home office running expenses claim for the entire year, allowing for periods when the home office is not used for income production (such as holidays, illnesses) and also allowing for concurrent use by other family members. A new diary must be kept for each financial year, as patterns of use are likely to fluctuate over two or more years. A railway guard claimed $3,700 in work-related car expenses for travel between his home and workplace. He indicated that this expense related to carrying bulky tools – including large instruction manuals and safety equipment. The employer advised the equipment could be securely stored on their premises. The taxpayer’s car expense claims were therefore disallowed because the equipment could be stored at work and carrying them was his personal choice, not a requirement of his employer. A taxpayer claimed self-education expenses for the cost of leasing a residential property, which was not his main residence. The taxpayer claimed he had to incur the expense of renting the property as he ‘required peace and quiet for uninterrupted study which he could not have in his own home’. This was not deductible. In addition to the rental expenses, the cost of a storage facility was claimed where ‘the taxpayer needed to store his books and study materials’. He claimed he needed this because of the huge amount of books and study material associated with his course and that he had no space in his private or rented residence where these could be housed. This was not deductible. The cost of renting the property was around $57,000, with additional expense of $7,500 for the storage facility. The actual cost of the study program he attended that year was only $1,200. A medical professional made a claim for attending a conference in America and provided an invoice for the expense. When the ATO checked, they found that the taxpayer was still in Australia at the time of the conference. The claims were disallowed, and the taxpayer received a substantial penalty. the right approach, it’s possible to enjoy some tax benefits out of your generosity, and also avoid Fringe Benefits Tax (FBT). But as always with tax, the landscape is layered with complexity. The following is a general summary of the tax treatment of Christmas giving. • Paying or reimbursing expenses incurred in obtaining something covered by the above points. What is recreation? Recreation includes amusement, sport and similar leisure time activities, for example, a game of golf, theatre or movie tickets, a joy-flight or a harbour cruise. Having identified whether or not your gift is entertainment, you then need to consider the value of the gift. Non-entertainment gifts to staff (such as Christmas hampers, bottles of alcohol, gift vouchers, pen sets etc. ), are tax deductible and you can claim GST credits, irrespective of cost. Note however that you can generally avoid paying FBT if you keep the gift under $300. If this threshold is exceeded, FBT will apply. Therefore, be conscious of this threshold when providing such gifts to staff this Christmas. On the other hand, entertainment gifts to staff (such as tickets to movies/theatre/amusement park/sporting events, holiday airline tickets etc.) which are under $300 will not attract FBT, are not income tax deductible, and you can not claim GST credits. If over $300, FBT will apply, but a tax deduction and GST credits can be claimed. With FBT rate at 47%, the tax deduction and GST credits available is unlikely to provide a better tax outcome than avoiding FBT by keeping the gift under $300. 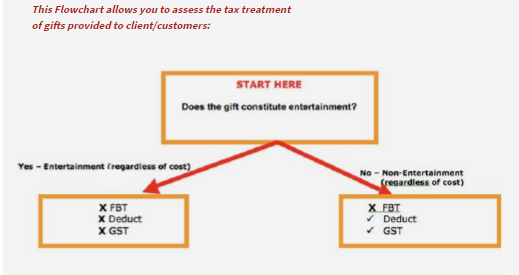 No FBT is payable, irrespective of the type of gift and irrespective of cost. 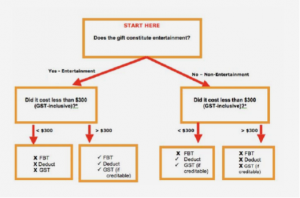 However, where a gift constitutes entertainment, no GST or tax deduction can be claimed. 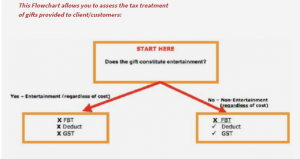 Thus, at least from a tax standpoint, it’s better to provide non-entertainment gifts to clients (Christmas hampers, bottles of alcohol, gift vouchers, pen sets) and, in doing so, enjoy a tax deduction and GST credits. Where this is the case, the total cost will generally be exempt from FBT provided the per-head cost (dinner and drinks) is kept to under $300 per person. This is known as the Minor Benefits Exemption. To enjoy this exemption the employer must use the Actual Method for valuing FBT meal entertainment. The Actual Method is the default method for valuing meal entertainment, and no formal ATO election is required to use this method. Under the Actual Method, an employer pays FBT (in the absence of an exemption) on all taxable meal entertainment provided to employees and their associates such as spouses (entertainment provided to other parties such as clients, contractors, or suppliers is exempt from FBT). The downside of using the Minor Benefit Exemption is that the meal entertainment is not tax deductible, and nor can you claim a GST credit. This Minor Benefit Exemption is not available if you elect to value your meal entertainment under the alternative 50/50 Method. 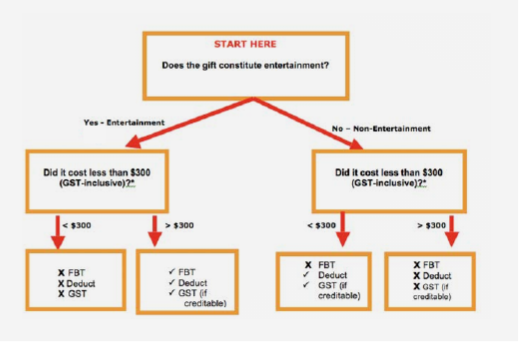 Under this method, you pay FBT on only 50% of all taxable meal entertainment provided to employees, spouses AND third-parties such as clients/contractors/customers etc. irrespective of the cost. Likewise, you can only claim a 50% income tax deduction and 50% GST credits on such meal entertainment. However as stated earlier, with the FBT rate at 47%, the 50% tax deduction and 50% GST credits available under the 50/50 Method is unlikely to provide a better after-tax result than the Actual Method where no FBT is payable. The “take-home message” is that if like many employers the only social functions you host for employees during the year are a Christmas Party (and perhaps the Melbourne Cup), be conscious of keeping the per-head cost under $300. By doing so, you may be able to exempt the entire cost of the party from FBT.